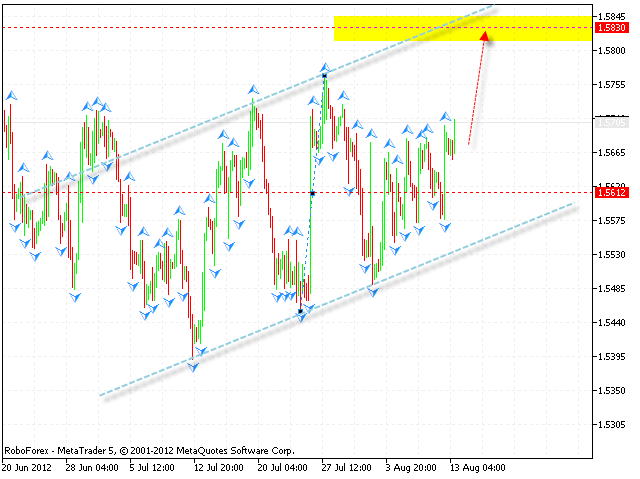 The EUR/USD currency pair is moving inside the ascending channel. At the H4 chart the price is forming also forming the ascending pattern, the final target of the growth is the area of 1.2530. One can consider buying Euro aggressively from the current levels and increase the amount of long positions only after the price breaks the level of 1.24. If the pair falls down lower than 1.2220, this scenario will be cancelled and the price may continue falling down towards the area of 1.20. The GBP/USD currency pair continues moving inside the sideways trend, currently the price is forming the ascending pattern with the target of the growth in the area of 1.5835. One can consider buying Pound aggressively from the current levels with the stop below 1.5660 and increase the amount of long positions only after the price breaks the level of 1.5750. If the price falls down lower than 1.5540, this scenario will be cancelled. The USD/CHF currency pair continues moving downwards. The RSI indicator has broken the trend’s ascending line at the daily chart. 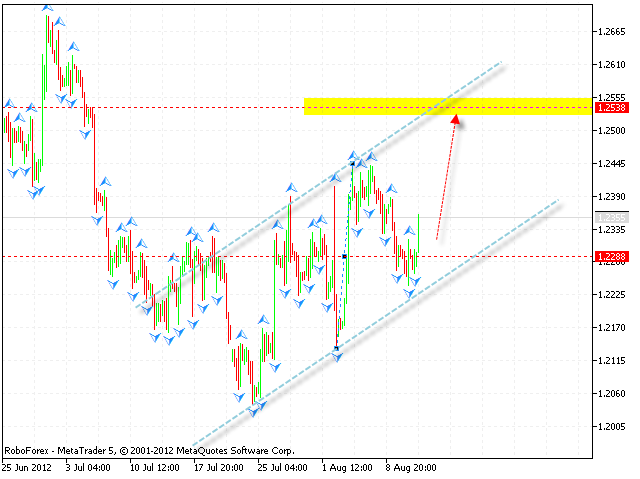 There is a possibility that the pair may fall down into the area of 0.9350. 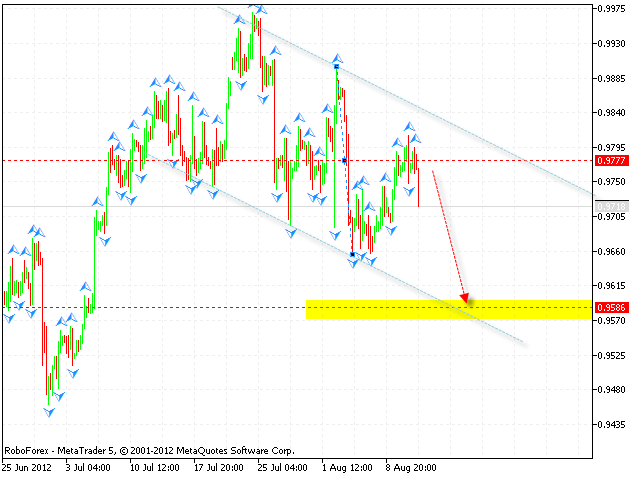 At the H4 chart the price is forming the descending pattern with the closest target of the fall in the area of 0.9580. One can consider selling Franc from the current levels with the stop above 0.9810 and increase the amount of short positions after the price breaks the level of 0.9640. If Franc grows up higher than 0.9840, this scenario will be cancelled. Australian Dollar has reached all the targets of the ascending pattern, currently the price is expected to start the correction. One can consider selling the pair aggressively near the level of 1.06 and increase the amount of short positions after the price breaks the level of 1.0495. 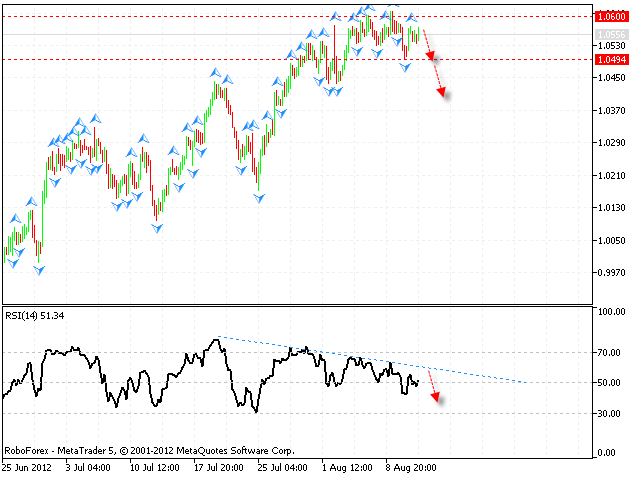 The test of the trend’s descending line at the RSI at the H4 chart is an additional signal to sell the pair. If Australian Dollar grows up higher than 1.0620, this scenario will be cancelled. New Zealand Dollar is still testing the support level in the area of 0.8080. 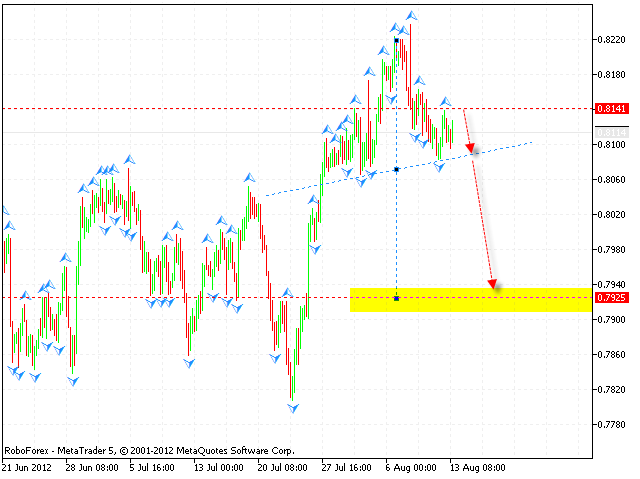 At the moment the price is forming “head & shoulders” reversal pattern, the target of the fall is the area of 0.7940. One can consider selling the pair aggressively near the level of 0.8140 and increase the amount of short positions only after the price breaks the level of 0.8080. If the price grows up lower than 0.8195, this scenario will be cancelled.